Johan Franzen has missed 16 games with a concussion he suffered after being hit by Tampa Bay defenseman Radko Gudas Dec. 15. 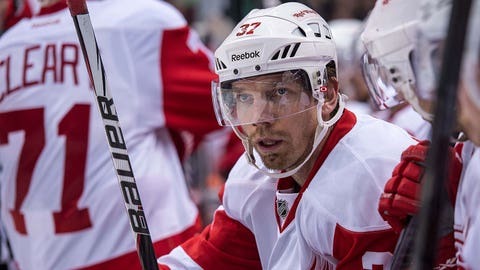 DETROIT — Johan Franzen is set to return, while Mikael Samuelsson is headed to Grand Rapids. Red Wings coach Mike Babcock confirmed Sunday afternoon that Franzen would return for the game against the Florida Panthers. "He can really shoot the puck," Babcock said. "Anytime you come back from an injury, I donât know how youâre going to respond. I mean, (Darren Helm’s) an example of that. "I donât know what to expect from the Mule. Weâre just going to play him and see how it goes." Franzen has missed 16 games with a concussion he suffered after being hit by Tampa Bay defenseman Radko Gudas Dec. 15. Are Wings ready for youth movement? A rash of injuries and slumping veterans have forced the Wings to abandon their comfort zone. Babcock said Daniel Cleary would be a healthy scratch, along with Todd Bertuzzi and Jakub Kindl. That means youngsters Riley Sheahan, Tomas Jurco and Luke Glendening remain in the lineup. "Obviously, itâs an important thing for us," Babcock said. "We need all hands on deck if weâre going to be successful. "I think these kids have given us some energy. What it does is it gives some of our veteran guys for example who are sitting out a chance to freshen up, which doesnât kill anybody either." 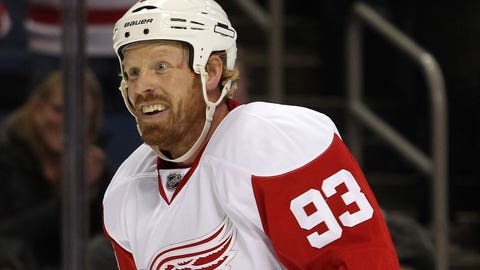 Samuelsson cleared waivers Sunday and was assigned to Grand Rapids, making room on the roster for Franzen’s return. Joakim Andersson, who has missed five games with a lower-body injury, is also ready to return and will play Tuesday in Philadelphia.